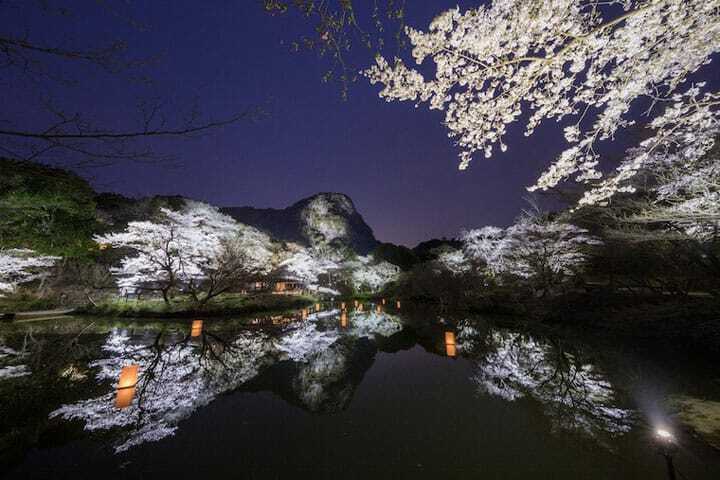 https://matcha-jp.com/en/1676 12 Best Night Cherry Blossom Views - Magical Illuminations! Cherry blossoms look amazing during the day, but you can also experience stunning views of cherry trees at night! Today we introduce some of Japan's most beautiful night sakura illumination spots. 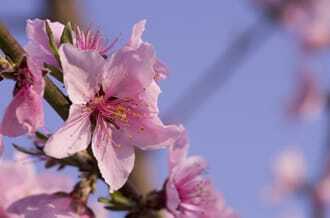 Cherry blossoms, or sakura, are a prominent symbol of spring in Japan. Although it is common for people to view the blossoms during the day, the view of cherry blossoms at night is extraordinary. 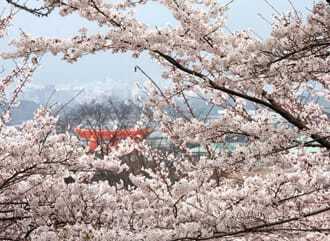 Major cherry blossom viewing spots are usually lit up, showing a magical side of Japan to the visitors. 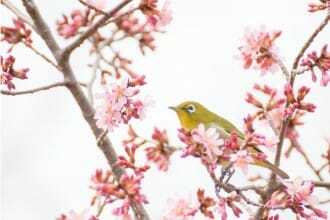 There are countless places all over the country where you can enjoy beautiful views of the cherry trees, but this time, we’ve chosen a few keeping in mind the expected dates of the first blossoms. *We will update any additional event information as it is announced. 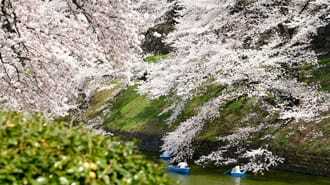 Maizuru Park is a popular cherry blossom viewing spot in Fukuoka Prefecture. 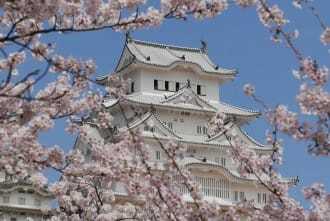 From late March to early April there is a festival that celebrates the beauty of sakura blooming along the castle’s stone walls: Fukuoka Castle Sakura Festival. During this festival, you can admire the fascinating illumination, enjoy the festival stands, watch events, and enjoy the lively atmosphere while seeing the cherry blossoms. 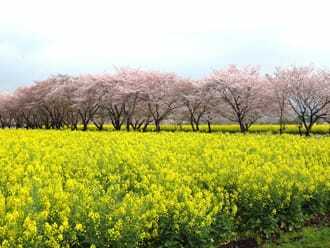 Mifuneyama Rakuen is a well-known destination for enjoying cherry blossoms in Saga Prefecture. There are around 2,000 sakura trees blooming within the traditional Japanese garden. In addition to the iconic cherry blossoms, there are also 20,000 rhododendrons blooming, with spectacular and colorful views will make you wonder if you’re admiring a painting. The illumination event lasts from mid-March to early April. The breathtaking views here have earned it the title of Kyushu’s greatest cherry blossom night-viewing event. Price: Adults 400 yen, elementary school students and younger 200 yen. *From March 17 to April 14, the fees are as follows: adults 600 yen, elementary school students and younger 250 yen. From April 15 to May 7: adults 700 yen, elementary school students and younger 300 yen. Access: 5 minutes by taxi from Takeo-onsen Station of JR Sasebo Line. About 1,000 yen. 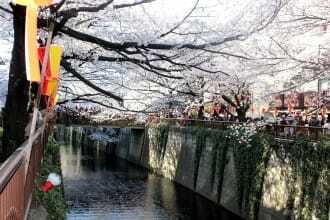 One of the most celebrated and visited cherry blossom viewing spots in Tokyo is Meguro River. 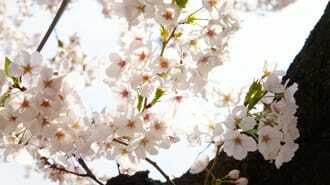 Each year during the cherry blossom season, countless people gather to celebrate this lively event. You can, of course, enjoy illuminations as well. This area has many chic stores and restaurants, too, where you can treat yourself to a meal or some shopping while admiring the cherry blossoms at night. 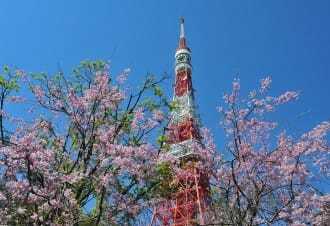 If you want to find out how to get to the Meguro River, refer to Enjoy Cherry Blossoms And Sweets At Meguro River, or 5 Excellent And Less Crowded Cherry Blossom Viewing Spots In Tokyo. Mori Garden is a Japanese garden located inside the grounds of Roppongi Hills, a shopping facility with numerous stores and restaurants. In spring, this area becomes very popular due to the wonderful cherry blossoms here, attracting couples on dates, and residents coming to relax after a day of work. This illumination spot lives up to its reputation as an "urban oasis." Access: directly connected with the 1C exit of Roppongi Station of Tokyo Metro Hibiya Line; 5 minutes by foot from the 3rd exit of Roppongi Station of Toei Subway Oedo Line. The night view of the cherry blossoms in Ueno Onshi Park is, along with Hirosaki Park in Aomori Prefecture, and Takada Park in Niigata Prefecture, known as one of the Top Three Night Views of Sakura in Japan. During the cherry blossom season, as many as 1,000 bonbori (paper lanterns) decorate the park, lighting up the blossoms beautifully. Access: 2 minutes by foot from Ueno Station of JR Tokyo Metro Ginza Line and Hibiya Line; 5 minutes by foot from Ueno-okachimachi Station of Toei Subway Oedo Line; 1 minute by foot from Keisei-Ueno Station of Keisei Line. JR Ueno Station Guide – How To Exit To Find Your Destination Quickly! Sankeien is a garden in Yokohama, Kanagawa Prefecture. When spring comes, about 300 cherry trees bloom in this garden. A number of buildings of great historic value are found all over the garden and were transported here from Kyoto and Kamakura. The buildings with beautiful cherry blossoms create a unique and harmonious scene. During the cherry season, the garden closes later than usual, at 21:00, and hosts a special event called Kanou Evenings. The cherry blossom trees and the buildings are lit up, providing an astonishing view for the visitors, much different than the one that can be seen during the day. 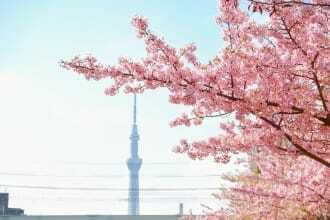 *Dates are subject to change based on when the cherry blossoms start to bloom. Access: Ride the city bus no. 8 or no. 148 from the eastern exit 2nd bus terminal of Yokohama Station, for about 40 minutes; get off at Sankeien-iriguchi bus stop (220 yen); walk for 5 minutes. 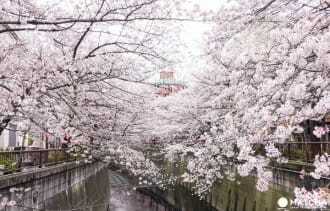 Kawazu Station in Shizuoka Prefecture is well-known in Japan for its lovely cherry blossoms. 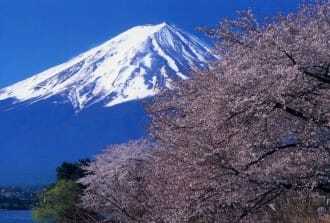 It is a popular destination for short trips from Tokyo since it takes no more than 2 to 2 and a half hour to reach it. Kawazu also has hot springs. During the annual Kawazu Sakura Festival held from early February to early March, visitors can relax at ashiyu (foot bath) for free at three different locations. Be sure not to miss the illumination event! 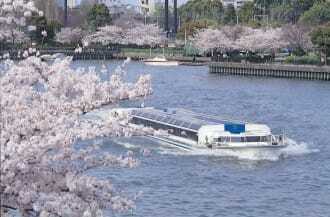 You’ll be stunned by the amazing view of sakura trees along the river, lit up in beautiful colors. Maruyama Park is the oldest garden in Kyoto, having opened in 1886. There approximately 800 cherry trees blossoming in spring, but the most popular is the weeping cherry ("shidarezakura" in Japanese), a famous cherry blossom illuminated at night in Gion. 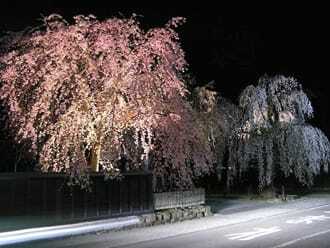 This park is very popular with its stunning night scenery of the illuminated cherry trees. 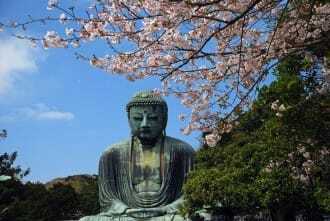 Access: about 10 minutes by foot from Keihan Gion-Shijo Station. You can also ride the city bus no. 100, or the bus no. 206 from the bus terminal closest to the main ticket gates of Kyoto Station, for about 20 minutes; get off at Gion bus stop (230 yen), then walk for about 5 minutes. 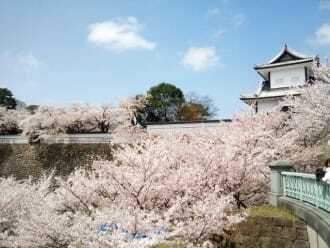 Yamatokoriyama Castle (Koriyama Castle), constructed in 1580, is a renowned cherry blossom viewing spot in Yamatokoriyama City, a castle town in northern Nara Prefecture. 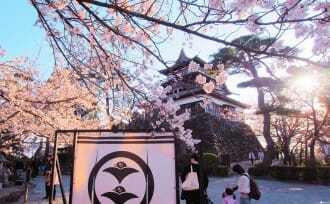 Its iconic sakura tree, or gotenzakura, has been popular for more than 400 years. Every year, from late March to early April, the Yamatokoriyama Castle Festival is held. 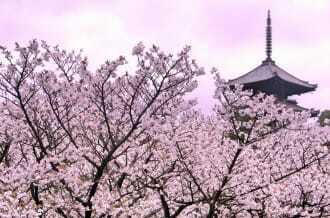 Both the cherry trees and the castle are lit up, creating a harmonious beauty. Utsubuki Park, situated at the foot of Mt. 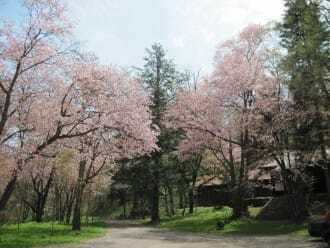 Utsubuki, is a symbolic park in Kurayoshi City, Tottori Prefecure, amazes visitors who come from all over the country with a variety of cherry trees flowering in spring. During the Kurayoshi Spring Festival starting in late March, 500 lovely paper lanterns of all sizes are illuminated, transforming the park into a magical scene with the beautiful cherry blossoms. Access: Ride the city bus from Kurayoshi Station via Shiyakosho (City Hall) for about 15 minutes (230 yen); then get off at Shiyakusho-Utsubukikoen-mae bus stop. The gorgeous cherry blossoms of Hirosaki Park are said to create one of three most beautiful night scenes of cherry blossoms in Japan. The view of illuminated cherry trees is especially stunning during the Hirosaki Sakura Festival, held annually for the past 100 years. Hirosaki’s cherry blossoms each bud into not just one, but several beautiful blossoms. 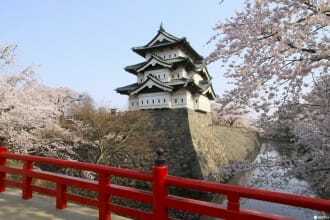 For more information on how to get there, refer to Hirosaki Castle, A Famous Cherry Blossom Spot In Aomori. 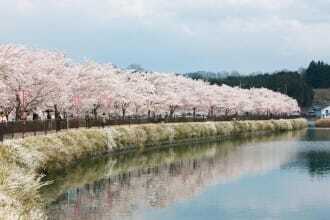 Takada Park’s cherry blossoms are known as the third best night cherry blossom view in Japan. At night Takada Castle and around 4,000 cherry trees are lit up with paper lanterns. The flowers reflecting on the water around the castle is a spectacular, must-see sight. 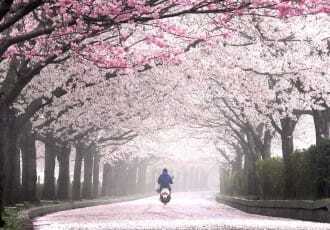 Cherry blossoms are a beautiful part of nature that vanishes in a blink of an eye. Make the most of this wonderful experience and see the flowers during the night too. To ensure you won’t miss this uniquely-Japanese opportunity in the spring, we suggest planning where you want to see before you go. **This article is a rewritten, 2019 version, of the original article published on February 26, 2016.